Italy (Repubblica Italiana) is a large country in southern Europe. It shares borders with Slovenia, Austria, Switzerland and France. There are also two small countries within Italy: San Marino and the Vatican City (Holy See). The capital city is Rome (Roma). Other big cities in Italy are Milan (Milano), Venice (Venezia) and Naples (Napoli). Italy is well known for its cuisine, fashion and sports cars. Italy is a member of the European Union and uses the Euro as its currency. People have lived in Italy for over 200,000 years. Around 800 BC (800 years 'before Christ'), Italy consisted of several Italic tribes and many Greek colonies that were created along the southern coasts of Italy and Sicily. The most famous of these Italic tribes are the Etruscan and the Latini. The city of Rome was part of Latium. Between that time and 200 AD, Rome grew larger and larger and by means of war and treaties, the Romans eventually conquered all the land of Italy and the Roman Empire governed over large parts of Europe, northern Africa and the Middle East. Italy, as a unified country, was established in 1861 although many parts of present day Italy (Veneto and Friuli-Venezia Giulia for example) didn't become part of the country until later. The last changes to the borders of Italy were in the 1950s when Trieste officially became part of Italy. Under the dictatorship of Benito Mussolini Italy built up an empire including Albania, Libya and Ethiopia and took control of the cities of Trieste and coastal regions of present day Slovenia and Croatia (where many native Italians lived). During World War II Italy was allied with Nazi Germany. Thanks to the Partisan movement, help from the British and American forces Italy was able to overthrow the fascist government eventually. Since 1946 Italy has been a republic. The present Prime Minister of Italy is Matteo Renzi. Italy is a land of contrasts and including a large coast line as well as mountains. Italy's highest mountain is Monte Bianco (known as Monte Blanc in English). The largest Italian islands are Sicily (Sicilia in Italian) and Sardinia (Sardegna in Italian). Italy's climate has resulted in a large industry for wine making. There are also two countries which are entirely surrounded by Italian territory: Vatican City and San Marino. Italy is home to many active volcanoes and is an active earthquake zone. The largest volcano in Europe is Etna in Sicily. Much of Italy has a Mediterranean climate with hot summers and mild winters but because of the large number of mountainous regions the climate varies enormously. Apart from in the mountains, the temperature in Italy rarely falls below 0°C and in summer often goes above 30°C. The population of Italy is around 60 million. Most people in Italy speak Italian but there are large minorities of German, Slovene and French speakers close to the borders with Austria, Slovenia and France. People in Italy have one of the longest life expectancies in the world. In the past Italy was a country of emigration and millions of Italians emigrated to countries like the USA, Canada and Argentina during the 19th and 20th centuries. Roman Catholicism is by the largest religion in the country, although the Catholic Church is no longer officially the state religion. 88% of Italians identified as Roman Catholic, although only about one-third of these described themselves as active members. Other Christian groups in Italy include Eastern Orthodox Christians, Greek Orthodox, Pentecostals and Evangelicals. The country's oldest religious minority is the Jewish community. It is no longer the largest non-Christian group. Italy has had a state-wide public school system, or Education System, since 1859. Today, there are two stages of education in Italy: primary and secondary. Primary school commonly comes after 3 years of nursery school (or kindergarten) although it is not required. Primary school lasts 5 years. Secondary school is divided into 2 stages. The first stage of secondary school lasts 3 years and involves an exam at the end of the year. The second stage of secondary school lasts 3 to 5 years. The most popular sport in Italy is football. Italy's national football, along with German national football team is the second most successful team in the world and were the FIFA World Cup champions in 2006. Popular sports include football, basketball, volleyball, water-polo, fencing, rugby, cycling, ice hockey, roller hockey and F1 motor racing. Winter sports are most popular in the Northern regions, with Italians competing in international games and Olympic events. Millions of tourists visit Italy every year. It is the world's 5th most popular destination for tourists with more than 25 million visitors every year. The most popular cities for tourists are Venice, Rome and Florence. 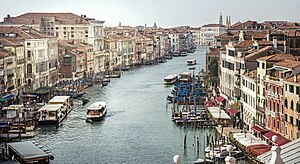 Famous sights include the Grand Canal in Venice, the Leaning Tower of Pisa and the Colosseum in Rome. Sights from the Roman Empire like Pompeii, Naples, Ischia, Capri and Baiae are very popular with tourists. Italy has more UNESCO World Heritage Sites (50 of them) than any other country in the world. The entire cities of Verona, Siena, Vicenza, Ferrara are World Heritage Sites.